Yurts are felt covered wooden structures traditionally used by the Turkic and Mongolian nomads in the Steppes of Central Asia. 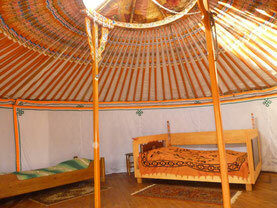 It is a herders most important possession and upon marriage a family will build or buy the newlyweds their own Yurt. It is fundamentally designed to be portable and carried using Camels or Yaks and It usually takes about six camels to move an entire families belongings and about an hour to pack everything that they do multiple times a year. and protect against extreme winds. While the Yurt itself is repaired and eventually replaced over a lifetime, the 'crown' is the centrepiece of the Yurt and would remain intact and passed from father to son for generations. The 'crown' provides all of the light and airing to the yurt and most importantly for the evacuation of smoke for the wood burning stove. You can sleep in the yurt up to 6 people. A kitchen with eating area is available just behind the yurt. 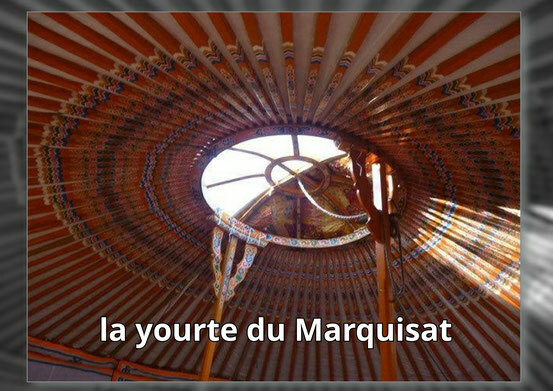 Thanks for our friend Olivier for made this video, you can discover how we build the yurt!